This chocolate cake is my absolute favourite; it’s moist, rich and filled with both ganache and buttercream (completely necessary in my opinion!). Make it for a celebration or get together and you will be very popular! Preheat the oven to 170c. Grease and line three 8 inch cake tins. For the cake, place the flour, caster sugar, baking powder, bicarbonate of soda, salt and cocoa powder in a bowl. Stir together with a whisk or wooden spoon. In a jug, mix together the eggs, vegetable oil, milk and espresso. Pour into the mixing bowl with the dry ingredients and whisk until smooth. Now add the boiling water in batches, gently stirring between each addition (it’s supposed to be runny so don’t worry if the consistency seems a bit odd!). Split the mixture between the three cake tins and bake for 35-45 minutes until well risen and cooked through. To test whether they are ready, insert a skewer- if it comes out clean it is ready to come out of the oven. Cool the cakes in the tins for 10 minutes then remove and transfer to a wire rack. Leave to drop to room temperature while you make the fillings. Firstly, make the ganache. To do this simply chop the chocolate into small pieces and place in a jug, then heat the cream until almost simmering and pour straight over it. Leave the chocolate to melt for a couple of minutes then stir to form your ganache. Set aside in the fridge to thicken and cool before you use it. Now make your buttercream. Whisk the butter until light and fluffy then gradually add the icing sugar and cocoa, whilst beating to combine. Add the vanilla and double cream and give it a final whisk- stop when you have a light, smooth frosting. 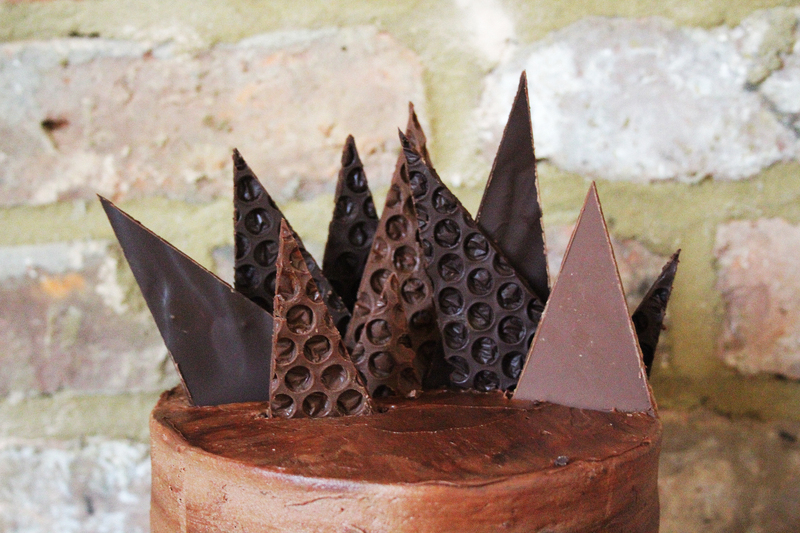 If you’d like to make your own toppers, simply melt the chocolate (melt separately for some contrasting shards) then spread a thin layer onto greaseproof paper. Set in the fridge while you assemble the cake then break into pieces and use as you wish. Now you are ready to assemble the cake. Level off the tops of the sponges with a cake cutter or large bread knife to make sure you have even layers. 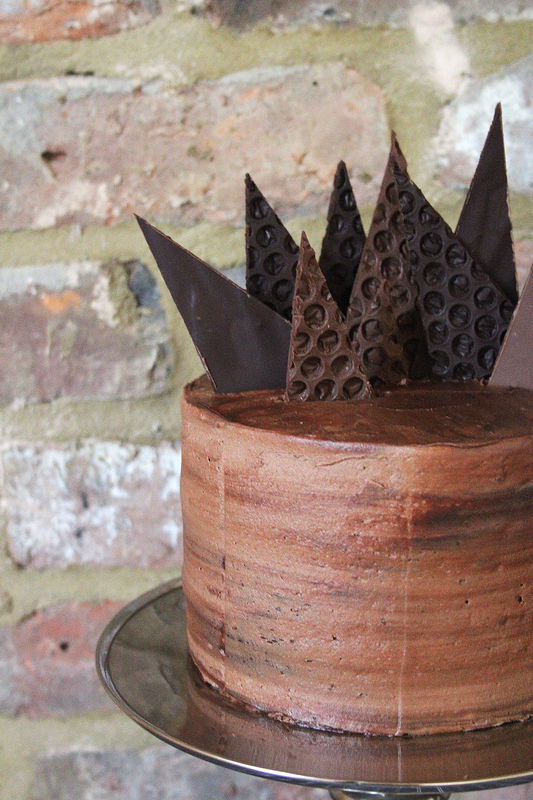 Take your first sponge and spread over a layer of ganache followed by a layer of buttercream. Top with the next sponge and repeat until you have a stack of three. Cover the whole cake in buttercream and smooth the sides with a palette knife or cake scraper. Decorate with the shards or any other decorations you fancy. Oh my! That looks utterly stunning.